GETTYSBURG, Pa. — Every night, tourists in this farming community, site of the bloodiest battle ever fought in North America, stroll city streets on commercial ghost tours. But visitors don’t need to pay to hear about ghosts. They only need to walk the 6,000 acres of battlefields, or simply step inside the brilliant new visitors center. Ghosts are everywhere. These ghosts are the sad, soulful memories of the more than 34,500 young Americans killed or wounded by other young Americans on the first three hot – and horrific – days of July 1863. Anything beyond a casual reading of that bloody to and fro causes you to mourn the victims, almost 150 years later. 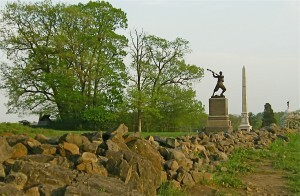 More than 1.8-million people come each year to Gettysburg National Military Park, a swath of rolling Pennsylvania countryside, to roam the land. A visitors center opened in 1974, but it could accommodate less than a fourth of the tourists. Its technology in displaying just a fraction of the million artifacts – diaries in fading ink, soldiers’ Bibles, rifles and cannon – was out of date. Cemetery Ridge, the objective of the ill-fated Pickett's Charge. Worse, though, was the realization that an adjacent parking lot and a building housing a deteriorating 1880s wrap-around painting of a famed battle sat atop the land where an estimated 971 soldiers had been killed. After years of planning and construction, in 2008 a $103-million museum and visitors center replaced it, on land that saw no major combat. The financing came from an unusual blend of public and private funds, with nearly three-quarters of it from individual and corporate donations. That interpretation includes more than an hour of films that explain not just the battle but also the history of America, from the Revolution to contemporary times. 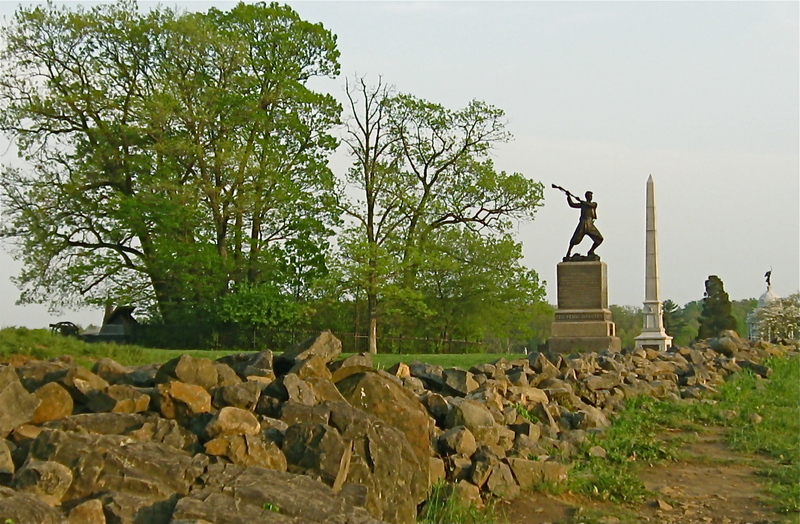 A 22-minute film has a few scenes with costumed actors, but largely depends on the filmmaking techniques that Ken Burns made so familiar in his PBS series The Civil War. Beyond twin theaters showing this film are 12 galleries covering about 24,000 square feet. Each gallery uses a phrase from the Gettysburg Address as its theme. But first, a sign tells those entering: “The Civil War was fought over three issues – survival of the Union, the fate of slavery and . . . what it means to be an American. The museum makes strong use of writings from the period. Some of these are audio narrations, most are presented as signs by various displays. — Jefferson Davis, in his inaugural speech upon becoming president of the Confederate States of America, in February 1861. — The Gettysburg Compiler newspaper, four days after the battle. I found a couple of galleries distinctive. One features actor Sam Waterston, the museum’s voice of Lincoln, reading the Gettysburg Address in a raspy tenor. Lincoln didn’t give that brief speech until more than four months after the two armies had withdrawn. The Confederate wagon train carrying the wounded stretched an estimated 17 miles. But left behind in the fields, orchards, rocky clefts and forested hillsides were 7,708 dead or dying soldiers, and thousands of dead horses and mules. So another memorable gallery describes this unimaginable aftermath thrust upon the 2,400 residents of the crossroads town. – Gen. Lee’s camp cot, writing desk and small stove show how simply the Confederate commander lived. – Three vertical plastic cases filled with shell fragments front a timeline and explanation of Union weapon efficiency at the famous Pickett’s Charge. 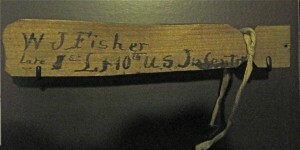 – A small wooden slat bears the scrawled name of a dead Union soldier. It had been tied with a leather thong to his wrist, identifying him for burial. Around it are letters written to his father by the soldier’s colleagues. 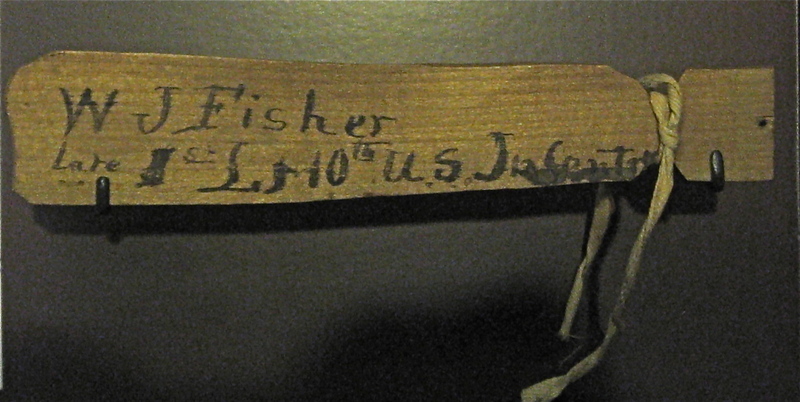 Tied to a dead solider's wrist, this tag named the victim. 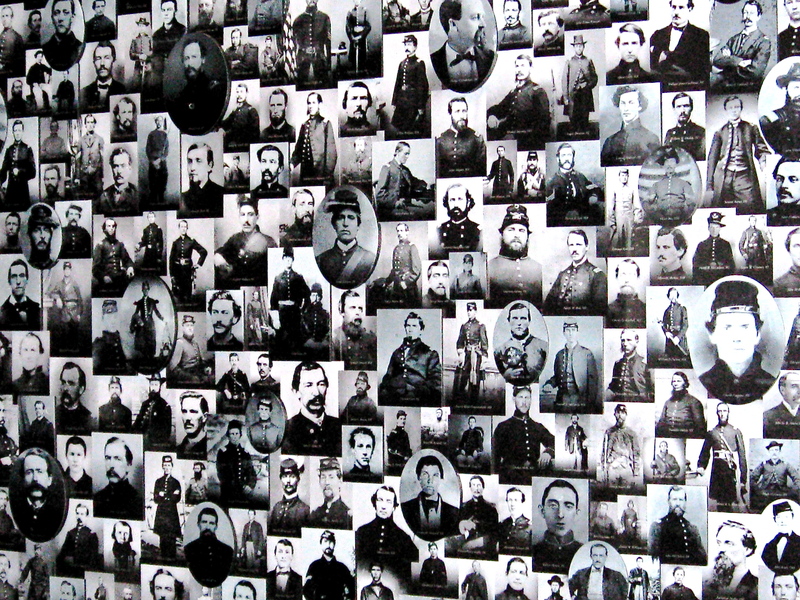 Wall displays hold rank upon rank of rifles from among the 28,000 recovered on the battlefield. About 23,000 of them were still loaded — and had not been fired by their wounded or frightened owners. 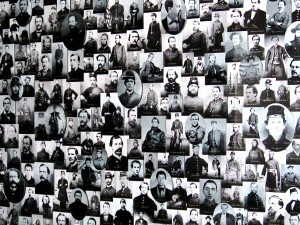 One wall is covered with photographs of 1,000 soldiers, 500 from each side. Each of these men was killed, wounded or captured. They represent all who fought here. “We want people to get out and walk the battlefields, experience it and leave wanting to learn more, to come back. The Museum and Visitor Center is open daily, except on Thanksgiving, Christmas and New Year’s Day. Entrance to the museum is free. Timed tickets to the 22-minute A New Birth of Freedom have varying fees for different age groups. GREENWICH, England — Kings and queens vacationed here for nearly five centuries. The world sets its watches from here. Sailors successfully navigate using a device on display in this town. All of it is a half-hour’s narrated boat ride down the Thames from the Tower of London. And vivid history lessons about science and exploration await visitors who walk a few blocks up from the river. One of the first buildings is the handsome Royal Naval College, originally designed by famed architect Christopher Wren to be a hospital and retirement home for sailors. The building known as the Painted Hall has a ceiling mural so vast that carts with mirrored surfaces are placed in the room so visitors can look down to view the paintings, rather than crane their necks and arch their backs. Beyond the college and the twin wings of the Queen’s House, originally built in 1638, later enlarged and now an art gallery, is a statue of William IV, at the edge of the vast lawn that is Greenwich Park. King, yes, but none then to the irreverent as Silly Billy or Sailor Bill. Those nicknames referred to his legendary drinking and womanizing — his mistress bore him 10 children, his wife bore none who lived — and his obvious lack of maritime skills. Visitors who climb the hill through the lovely green park past the picnickers and scampering children reach the Royal Observatory. From the hilltop, you can look back to London and see the dome of St. Paul’s Cathedral, six miles upstream. In the late 1600s, Greenwich was already a desirable location for London’s well-to-do, easily reachable via the Thames yet clear of the smoke and crowds of the working class. It was King Charles II who decreed that his Royal Observatory be situated on the hilltop. Who else but Wren, himself an astronomer, would be chosen to design a home and work space for the royal astronomer, John Flamsteed? More than 325 years later, Flamsteed House is still lovely to look at and intriguing to tour, because it is a museum that chronicles mankind’s effort to chart time, the heavens and our place anywhere on this globe. This last chore was largely accomplished over 40 years by a nonscientist, the clockmaker John Harrison. On display are the “sea clocks” Harrison fashioned. He wanted moving parts that would neither freeze nor shrink in the extreme conditions through which Britain’s military and merchant ships sailed. The clocks finally allowed navigators to determine their position east and west. The clocks’ accuracy led to drawing the lines of longitude and, in the 1770s, won Harrison a prize of 20,000 pounds, a fortune then. The continued study of measuring time is told in other exhibits, including a version of an atomic clock judged to be accurate within 1 second over the passage of 15-million years. Outside the observatory, many visitors pose for a gag photo, with one foot in the western hemisphere and one in the eastern. They can do this because first British and then international authorities decreed that the prime meridian, the line of zero degrees longitude, would pass through the observatory grounds. The nearby National Maritime Museum, which chronicles the history of the greatest seafaring nation ever, is not only imaginative but fascinating. You can easily spend an afternoon learning not only why Great Britain established the empire “upon which the sun never set” but also how it was created — often through invasion and slavery. From the 2-million-plus items in its collection, the museum displays ship’s models, figureheads, ancient navigational aids and maps. One gallery displays maritime paintings and even clips from a color documentary on vacation cruising from a half-century ago. Another gallery is a fascinating discussion of exploration. This is highlighted by remarkable film of Ernest Shackleton’s ill-fated 1914-16 voyage to the Antarctic. His ship Endurance was locked in the ice for about nine months in 1915. Viewers watch its demise: as ice floes come together, the vessel is crushed and sinks. Shackleton and the 27-member crew made it to an uninhabited island. He and five others then went for help. Not until August of the next year were all of them rescued. Yet another gallery is devoted to the empire’s greatest naval hero, Admiral Horatio Nelson. Surely millions of tourists to London have passed Nelson’s Column in Trafalgar Square without understanding why it was erected. The answers are in this gallery. In October 1805, off the coast of Cadiz, Spain, the 47-year-old Nelson led an armada of 33 ships against a force of equal size from the Spanish and French navies. In about two hours, the British sank or disabled 18 enemy vessels, killing or wounding 6,000 of the enemy. The British lost no ships, though some were no longer worthy as fighting ships, and suffered casualties of 1,700. Among those killed was Nelson, shot through the shoulder and spine by a sniper perched in the mast of the French ship that Nelson’s Victory was battling. On display is his uniform; you can see the bullet hole below his left shoulder. Consider the following qualities attributed to Nelson: decisive, courageous, a leader from the front, unconventional in his attack plans, adaptable. GETTING THERE: From London, you can reach Greenwich the slow, picturesque way, by a narrated cruise down the Thames, or the fast and impersonal way, connecting with the Docklands Light Railway, an elevated commuter train, from the Bank Tube stop near the Tower of London. FOR MORE INFORMATION: Go the Web site, ; each of the museums has a link from this page. 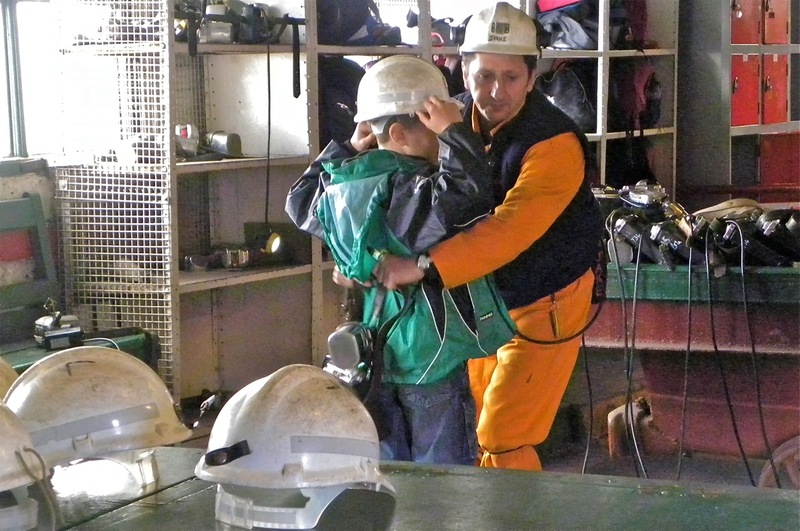 A former miner suits up a child for the trip 300 feet down, at the Big Pit Museum. Discovery of a high-grade coal soon would eradicate the place where tourists once had come to admire the bucolic life. Ironically, a series of museums on the actual industrial sites now boosts Wales’ tourism into a significant economic factor, helping to offset the revenue lost when mining ended in the late 20th century. At the height of the period roughly between 1780 and 1980, about one in four Welsh were miners. For more than half of that time, that meant all Welsh people, not just men: Children as young as 5, and women, also went below ground. They worked 12-hour shifts, six days a week. As still-remaining cottages show, miners and their families usually lived in company-owned housing – six to 10 people somehow crammed into four small rooms. Well into the 19th century, these hovels had no running water. A water pitcher sits on the windowsill of one of the stone cottages the supervisors' families occupied more than 200 years ago at the Blaenavon Iron Works. The basic ingredients of iron are iron ore, coal, limestone. All of these were in abundance beneath the Valleys. And deposits of all three were discovered fairly close together near the village of Blaenavon (bly NAH vin). Industrialists set up mining operations and also constructed blast furnaces – in which the three minerals were heated together at about 2,700 degrees. Now a fascinating UNESCO World Heritage Site, the Blaenavon Ironworks opened in 1789 with three blast furnaces, but within years it was among the largest iron manufacturing facilities in the world. What had been an isolated village of perhaps 100, before the ironworks opened, by 1871 had soared to 9,736. Now, grasses grow atop the chimneys of the four remaining furnaces. Visitors can walk up to the mouths of the furnaces and a couple of subsidiary buildings, listening to explanations of the process at five audio stations. Just a few yards from the furnaces and outbuildings are a row of stone cottages built at the end of the 18th century to house the most-skilled of the workers. 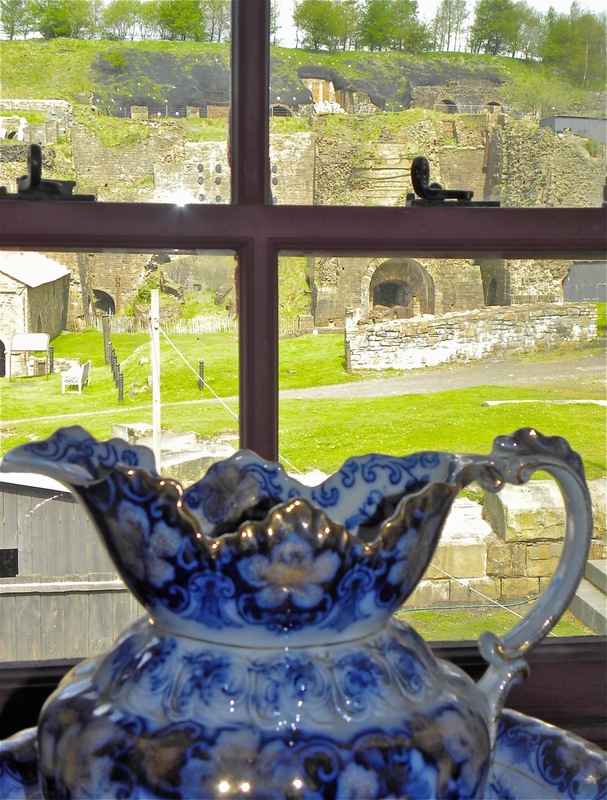 Two of the cottages have been furnished to show life here in 1791 and 1841. About 700 yards down a steep hill is the contemporary village of Blaenavon, home to about 5,800 people living in modernized row houses built for ironworkers. The excellent Heritage Center has interactive displays, black-and-white illustrations and photos, and an excellent timeline, bringing the hard era to life. The Big Pit National Coal Museum eliminates a lot of the guesswork about life in the mines. Outfitted with a helmet — you’ll need it, unless you’re shorter than 5 feet – a helmet light, and a leather belt holding the light’s battery pack and an emergency breathing device, you’ll be led for about an hour through shafts as much as 300 feet underground. When the guide – all are former coal miners – instructs his visitors to turn off their lamps, you will experience a darkness like no other. The Rhondda Heritage Park offers a different sample of the miners’ life, taking visitors through buildings that once supported below-ground operations and now uses recordings and mannequins placed in period clothes to discuss another era. The tour here, also led by a former miner, is briefer and less physically challenging than that at the Big Pit. It includes discussion of deadly accidents and how miners used specialized lamps to detect deadly gases. Getting there, staying there: British Airways and several other airlines fly between North America and London, which is about 2 hours’ drive or train trip from Cardiff, Wales’ capital and formerly the No. 1 coal-shipping port in the world. Cardiff’s cutting edge hotel, in the recently rejuvenated Cardiff Bay area, is the handsome St. David’s Hotel and Spa. For more information: Check these web sites on the places described here; only Rhondda Valley has an admission charge, because it is operated by the county, not Wales’ national historic-sites agency. Sheer granite walls, waterfalls, historical architecture and museums explaining life from the 1300s to the 1900s — and all the fish you can eat.